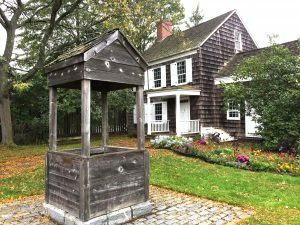 At our Interpretive Center, visitors can delve deeply into Whitman’s life and poetry through a series of exhibits that allow you to follow through his boyhood on Long Island to his international prominence as one of our country’s greatest visionaries. The exhibits display over 130 portraits of Whitman as well as original letters and manuscripts. Walt’s writing desk that he used as a young teacher on Long Island is also on display. Visitors may hear a recording of Walt Whitman’s voice as recorded by Thomas Edison in 1890. 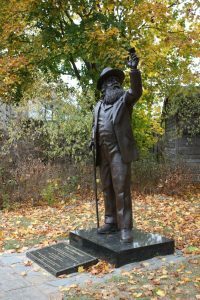 Just across from the Interpretive Center is a beautiful panoramic view of the Birthplace, the Gathering House, and a bronze statue of Whitman. Walt Whitman’s desk used while a teacher on Long Island in 1840. Walt Whitman is one of the most photographed poets of all time as seen here in over 130 portraits. 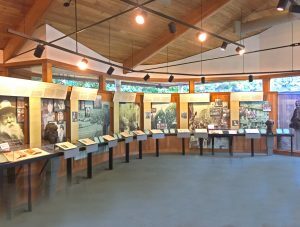 The Interpretive Center displays the entirety of Walt Whitman’s life. 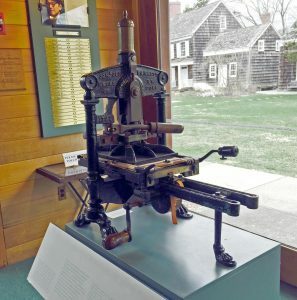 Albion printing press used by The Long Islander circa 1830, founded by Walt Whitman in 1838. 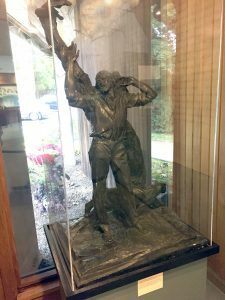 Plaster cast Young Walt Whitman Singing by Alexander Sterling Calder made in 1935. 8’ bronze statue Whitman with Butterfly stands along the gardens of the Birthplace. The Gathering House is located where a farmhouse once stood. 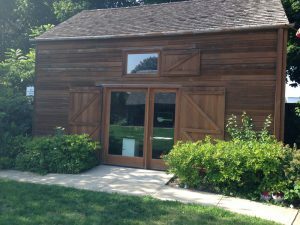 The wood boards that make up the Gathering House were once a part of the historic barn. Built in 2004, it houses temporary art exhibits and private and public events. Well outside of the Birthplace where it once stood.